Home » Entertainment » Health » Mama June shows off shockingly slimmer figure as she heads to gym -- Watch! Mama June shows off shockingly slimmer figure as she heads to gym -- Watch! Mama June Shannon may come face-to-face with her ex Mike "Sugar Bear" Thompson's fiancee, Jennifer -- but she's well on her way to getting her "revenge body." In ET's exclusive first look at Friday's episode ofMama June: From Not to Hot, the reality star's 11-year-old daughter, Alana "Honey Boo Boo" Thompson, asks her a big favor. The former child pageant contestant explains that seeing as she's going to be a flower girl in her father Sugar Bear's wedding, his fiancee asked if she would go look at dresses for the wedding party. Honey Boo Boo insisted that her mother go with her. "I wanted to ask you if you wanted to come," she says as Mama June lets out a big sigh. "For not Sugar Bear, not Jennifer, but for me, for my support." "Uh, that s**t ain't gonna happen," Mama June exclaims. "I mean, that's a little messed up, especially for an event like this." "I don't know why Jennifer would call an 11-year-old and not me," she says while talking to the camera. "I mean, what type of woman does that? Is she that scared of me?" Mama June is on her way to the gym before she's approached by her daughter, and it's clear that she's been working on her fitness quite a bit. 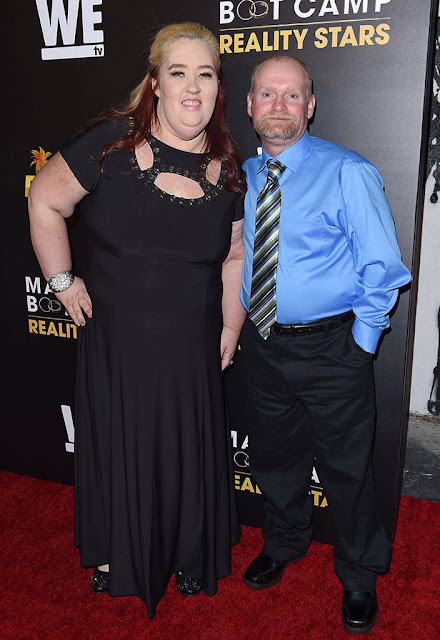 ET recently spoke with Honey Boo Boo and Mama June's 17-year-old daughter, Lauryn "Pumpkin" Thompson, about their mother's transformation, and they revealed that she slims down to a size four by the end of the season. "Momma's doing really good," Pumpkin said. "I think that her biggest [insecurity] that she still has to [get over] is that fact of, I think she still thinks of herself as a bigger person. Because, even to this day, like a couple of days ago, we had a conversation, and she is like... she looked in the mirror and was like, 'I'm still fat.' And I guess because she's seen herself as a bigger person all these years, she doesn't realize how small she is." Mama June Shannon‘s trainer has tough love for his reality star client. In an exclusive PEOPLE Now clip from Mama June: From Hot To Not, Shannon and her trainer, Kenya Crooks, take a break on park swings to reevaluate her slim down goals and whether she is losing weight for herself and not just revenge. “The reason why I’m pushing you so hard is I know you can do better. Question: Why are you doing this?” Crooks starts. Crooks is skeptical and says June’s reasons don’t have to do with her. “At some point you have to make a conscientious decision to start putting yourself first,” he urges. Mama June's Workout Turns Into an Expletive-Filled Rant Against Sugar Bear: "You Ruined My Life"
Mama June Shannon is turning her pain into purpose. In an exclusive sneak peek at tonight's all-new episode of Mama June: From Not to Hot, Mike "Sugar Bear" Thompson's ex heads to the baseball field for an outdoor workout. When she doesn't exactly feel motivated to break a sweat, her trainer offers an idea that proves to be more than valuable. "Whenever you're dealing with somebody who has frustrations going on, one of the things you have to do is you have to provide an outlet," Kenya shared with the cameras. "And there's no greater way than to let somebody punch up on." With boxing gloves wrapped around her hands, a noticeable slimmer Mama June begins her workout while also revealing all the hurt and anger she feels towards her ex. "You're a cheater. You won't live your own life. Get the f--k out of mine," she shouts. "I hate you. You ruined my life. Screw you Jennifer. Get your own life, get your own wedding." So why is Mama June so angry? For starters, she's not exactly thrilled to be meeting Sugar Bear's fiancée after she invited Alana "Honey Boo Boo" Thompson to join her for wedding dress shopping. "Kenya's here trying to pump me up, but I'm not in the mood for it. I've got too much on my mind," Mama June confesses. "I can't believe Sugar Bear's fiancée Jennifer is making me this upset and this anxious." She added, "I guess it has to do with because she's trying to involve my kids and that's something I'm very protective over." 0 Response to "Mama June shows off shockingly slimmer figure as she heads to gym -- Watch!"